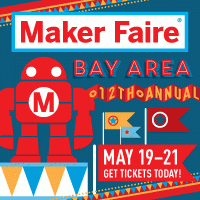 Manila Gear will be at the Bay Area Maker Faire, which runs from May 19 to May 21. This will be our first time at the faire. We’re looking forward to showing our current and upcoming projects, and sharing our design choices and making processes. If you are planning to attend the faire, do drop by and say hello! This entry was posted in General on May 15, 2017 by John Valdezco.